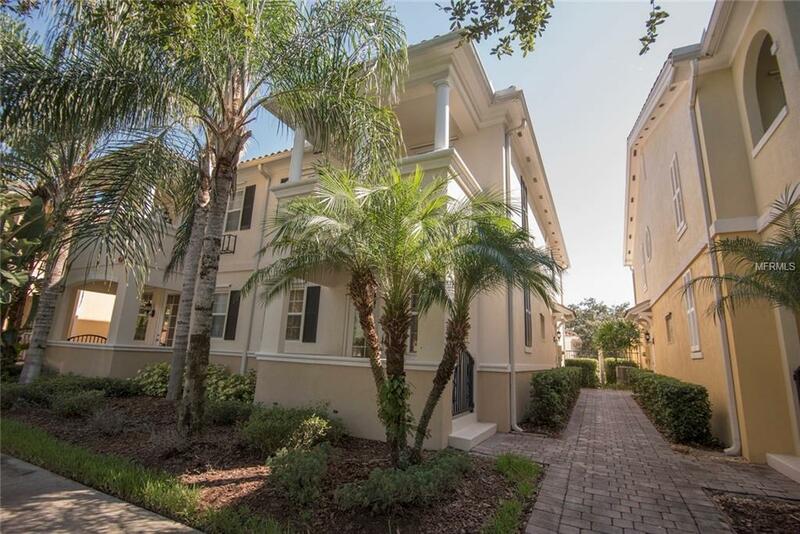 Don't miss this well maintained 3 bedroom/3 bath townhouse with 2-car garage in the gated and highly sought after Village Walk of Lake Nona. The property features ceramic tile flooring with carpet upstairs and a downstairs suite with an entrance out to a covered patio-perfect as a guest suite or office. The kitchen features with Corian solid surface counters, tons cabinet space and a breakfast bar. Open to the kitchen is a spacious family room which then opens to the covered and private rear patio/courtyard. Upstairs, you will find a spacious master suite with walk-in closet, balcony with a great view, and a master bath with double vanity. In addition, there is. This property also features a large outdoor covered patio/courtyard between the garage and rear of the building, a 2-car garage with auto-opener, plenty of closet space throughout, washer/dryer hookups. Included in the HOA Fees are lawn maintenance, internet, and security alarm monitoring. The Village Walk at Lake Nona community features a gated entrance, state-of-the-art fitness center, community gas station, heated resort-style pool, tennis pavilion with 6 lighted tennis courts, a lighted basketball court, tot lot, lakeside gazebo, and much more. The Village Walk at Lake Nona Community is located just off Narcoosee Road in Lake Nona and is 5 minutes from Medical City, and 2 minutes from SR 417 (Greenway) offering quick access to MCO (Orlando International Airport), SR 528 (Beachline), local shopping, dining establishments and schools.